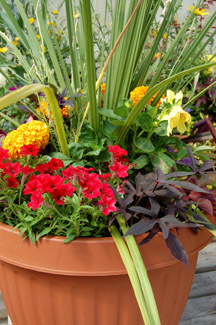 This easy-care accent plant (in the center of this pot of flowers) is called a “thriller” because it is tall, upright and adds vertical interest to hanging baskets and containers. It can go in the center of a pot so that it can be viewed from all sides, or at the back of a pot that will be displayed in a corner or against a wall. 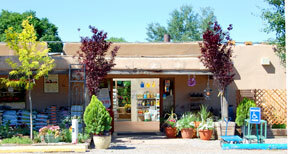 It likes well-drained soil and regular water, but is drought tolerant once established. It can be kept year-round as a houseplant.